Scanned from the All Colour But The Black artbook. Understanding, wise and frail is the Captain of the Thirtheenth Division. Ooo....this is pretty. I just can't resist a long hair guy. I like the way the words are written in the backgroud. I may be screaming Byakuya-fangirl, but I still love Ukitake... Well, after death, I simply must go to 13th Division XD. Thank you for sharing such lovely image ! Ukitake<3 He needs more love! 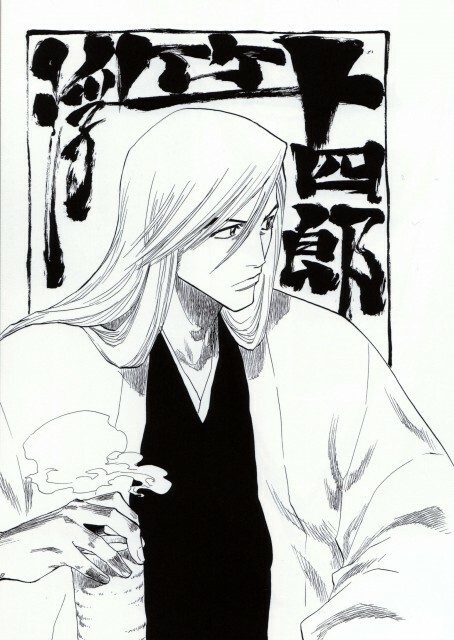 Ukitake-san is one of dandy character in Bleach. Wanna see his power too! I really enjoy these black and white sketches. thanks for sharing here the great scans !